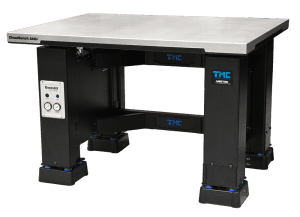 CleanBench Aktiv™ lab table is TMC’s latest breakthrough in advanced floor vibration control for laboratory workstations. Designed to isolate ultra precision instruments from building floor vibration down to below 1 Hz, CleanBench Aktiv is ideal for optical microscopes, scanning probe microscopes, interferometers, and other surface metrology instruments. In the especially critical 1-3 Hz frequency range, it provides up to a factor of 40 improvement over the best air isolated tables, unprecedented level of performance in such a compact table.